The basement of the Salmon Arm Museum at RJ Haney Heritage Village was bursting at the seams when the Kew Homestead from the Salmon Valley was emptied last year. 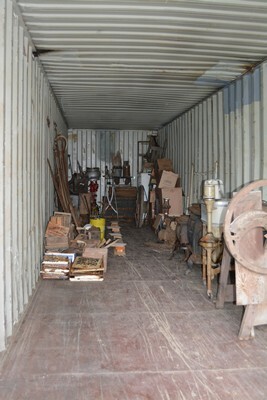 The homestead was moving to a permanent location and all the artefacts, doors, and windows had to be removed. A few staff and a great team of volunteers emptied the log cabin and then there was a crisis. Where to put the museum’s stuff? The farm implements were placed on pallets in the staff parking area and tarped for the winter. The container was an opportunity to solve a storage issue until other exhibits in the village were built. Once the empty relocated Laitinen,Pidhirney, and Kew houses receive their occupancy permits, artefacts in storage will see light. “Why collect so much?” seems like a reasonable question. “It is what we do, why we’re here,” answers Rosemary Wilson with fire in her eyes. Rosemary’s passionate about RJ Haney Heritage Village where she volunteers three days a week. She’s right of course. Collecting is one of the five functions any community museum is supposed to do. “But the collecting can’t be indiscriminate,” Rosemary believes. “There’s only so much storage space.” Rosemary’s been on the board for a long time. Seven years ago she helped revise the Museum’s collections policy. It was restructured to give staff better guidelines for accepting artefacts. Since then there’s been a moratorium on collecting specific items like skis, skates, Gestetners, typewriters, adding machines, cash registers, apple picking bags, grass seeders, adding machines, glasses, planes, chisels, saws, scythes, natural history relics, snow shoes, egg crates, men’s toiletry items, cigarette containers….. the list is extensive. Why did the Board limit collecting? Rosemary has the answer. Rosemary also argues that some things just need to be saved, like the artefacts in the Salmon Valley Homestead that were in storage for twenty years. “They are special and will be needed to tell the orcharding history of the area,” she said. With the Homestead moved, assembling the Peterson Barn is next on the list of things to do at the Village. When the site is complete, dairy and farming artefacts will be moved into the barn. It will be the perfect place for the cream separator, apple box lidder, apple press, conveyor for apple boxes, and other farming equipment. “That’s when we’ll have a real village,” Rosemary says. Thanks to the City of Salmon Arm and a super Job Creation Crewthe Salmon Arm Museum can continue to do what it does best, preserve, collect, display, research, and interpret the history of Shuswap. The Salmon Valley Homestead cabin sat for two decades on temporary footings in the parking lot at R.J. Haney Heritage Village after its move from the Minion Farm at Salmon Arm West. This summer, with funding and a plan in place, it was moved to its permanent location - officially becoming the nucleus of the homestead site at the edge of the Village. Albert Blackwell had jacked the building up earlier in the fall, and placed it on two steel rails in preparation for the move, to help the first phase of the repairs. After the building was emptied, Duncan Morris and his staff at Traditional Log Home Builders replaced rotten logs and readied the log structure for its move. Albert was donating his company’s time for the move, so the Board and staff at R.J. Haney Heritage Village waited patiently. The snow came. The snow melted. The rain came. The grass grew. When Blackwell Building Movers was unable to move the building for technical reasons, Haney Village's Ted McTaggart convinced Fred Emmerzael of Little Projects Ltd. that this was just the sort of little project that he needed to volunteer his staff and equipment for. Albert Blackwell had placed the log house on a single axle trailer. Dave Johnson, the mechanic for Little Projects, drove the company's front end loader and slowly, with a lot of instruction from people ahead of him, made his way down the driveway, turning left at the McTaggart residence, and going over the field to the area where the cabin was supposed to be. It was a tense few hours. Dave was sitting on his front end loader, pushing the log cabin on wheels down the driveway from behind. There were lights and trees to avoid and he couldn’t see them. At one point Dave was getting too many directions from too many "Village people." He calmly turned off his machine and there was silence. He wasn’t taking a chance on moving the structure until he got a consistent, all clear order from all the eyes out front. The “eyes” consulted each other. Dave turned on his loader and resumed his journey. It took a couple of hours but the log cabin went over a hill, through a field and stopped near eight waiting Sonatubes filled with hardened concrete. Thanks to a Job Creation Program’s staff and Duncan and Colin at Traditional Log Homes Ltd., a shake roof was installed. The project couldn’t have been accomplished without tremendous community support from the Shuswap Community Foundation, two building movers, and a great crew. She’s right, but it is a view few will have the privilege of sharing. 2013: Mrs. Haney gets upper kitchen cabinets! Thanks to Grants-in-Aid funding from the City of Salmon Arm, upper kitchen cabinets were installed in the kitchen at Haney House this spring. The encouraging words from the committee adjudicating the applications last winter noted the quality of the application, the fact that the project was for a capital item and project based and that this set of cabinets would finish the restoration of Haney House. Wayne Peace of Pea-Oui Contracting consulted with the curator on design. He also looked at the other built in furniture in the dining room for inspiration. Then he set to work. Because the plaster outer walls were irregular, the upper cabinets were tricky to install. Wayne cleverly installed the new cabinets and they look right at home. Artefacts were placed in the glass cupboards. What did the committee mean about finishing a restoration? In recent years, the house was jacked up and a new basement poured, two layers of roofing material were removed and a new shake roof put on. The house was painted and storm windows built. The storms had UV filter film installed. It didn’t stop there. We discovered asbestos insulation in the attic! Recognized as a health hazard, the insulation was removed and a new, safer alternative was blown in. Mrs. Haney’s house is good for another century. Thank you City of Salmon Arm and the Grants-in-Aid Adjudication Committee! Mrs. Haney’s kitchen is indeed finished! Thanks to the continued support of the Shuswap Quilters' Guild, Fabricland, and one very special and talented volunteer, Linda Erlam, the toddler's room in Haney House has new curtains. Most people don't know but the Quilters' Guild donate annually to projects that help protect the textiles at the Salmon Arm Museum. Their favourite project is Haney House. Two years ago the Guild instigated a project and we installed UV filter film on all the storm windows at Haney House. This year I approached Guild members for the material to sew new curtains in the infant and toddler room in the Haney House. More than twenty five years ago Helenita Harvey, Irene Olson and other "Museum Friends" set up the restored bedrooms in the house. Over the decades, direct sun through unprotected windows rotted the fabric. When staff member Pam Thomson sewed sheets into curtains, she knew it was temporary. She was using what we had on hand and there was no budget for fabric. We both knew we needed period-appropriate 100 percent cotton material for some nice curtains. Linda Erlam at Design Sewlutions (http://www.designsewlutions.ca/) is also a friend to the museum. She has volunteered to sew for the House and exhibits before. When I approached her this time, her response was immediate. Linda said she'd go over to Fabricland on her coffee break and look at fabrics. Linda asked the staff at the store to set aside three possible samples. I went in the next day and couldn't resist. Linda and I agreed. The fabric with the embellished trim was perfect. Denise Green, the owner of Fabricland, gave the Museum Association a super deal and the project came in under budget. Within the week Linda dropped off the curtains at the museum. We marched them over to the house and hung them on the waiting rods. They looked perfect. Thank you Linda, Denise, and the members of the Shuswap Quilters' Guild. 2013: Lester and Thomson Garage opens! The Lester and Thomson Garage officially opened August 11, 2013 at the Classic/Antique Car Show at the Village. The opening completed a project begun in 2003. Thanks to the Shuswap Chapter of the Vintage Car Club, the Vancouver, Hamber, and Shuswap Community Foundations, and our own Endowment Fund, there's something new to see at the Village. Check out the exhibit. 2012: Running water and a kitchen sink! When the Shuswap Community Foundation awarded $3000 to the Salmon Arm Museum, from the Lloyd and Dorothy Askew Fund, it was disbursing money to one of many charities in the Shuswap. The Kitchen Project was going to make one museum staff member very happy. The funded project addressed a long time desire. This curator wanted Mrs. Haney to have a comfortable kitchen to work in. The original kitchen had been replaced in the 1950s. Everything was modernized. When the Museum took took up restoration of the Haney House, the sink and cupboard didn't fit with the era but it wasn't removed until 1993. Although the bedrooms, original bathroom, living room, and dining room were all stripped of their not-so-original paint colours and wallpaper, the problem in the kitchen was never addressed. Other projects took precedence. In 1993, the main floor had its fir floors refinished and there was enough money left over to put Battleship Marmoleum in the kitchen. The new flooring in the kitchen was period appropriate and a lovely shade of green. With JCP and Heritage Legacy of BC funding secured, a new roof went on Haney House in 2011. The City of Salmon Arm stepped forward with the funding to remove the asbestos in the attic. The Shuswap Quilters Guild and Glass Protect installed UV Film to protect the artefacts in the house. Still Mrs. Haney had no kitchen sink to do her dishes in. Fortunately, the Shuswap Foundation awarded the Museum Association with a grant to build the kitchen sink cupboard and restore three chairs from the Montebello Hotel. This spring Pea-Oui Contracting installed a reproduction 1910 sink cupboard. A donated antique cast iron sink and sink taps completed the picture. Staff members know that both Mr. and Mrs. Haney would be pleased. Maggie Haney has somewhere to prepare tea for her visitors on her "at home" day. RJ Haney has an all-too-familiar seat that came from the much loved hotel and public house that burned down in 1967. Thank you Shuswap Community Foundation. Construction and Maintenance Manager Ted McTaggart tells Shuswap Community Foundation President Karen Angove a "fishing story" in one of the three reupholstered chairs from the Montebello Hotel. Karen's parents, Lloyd and Dorothy Askew, started an endowment fund with the Foundation and the interest earned paid for the new kitchen sink cabinet for Mrs. Haney and the restoration of the Montebello chairs. The Curator promises that the bottles are artefacts.